Author Lisa See may not look Chinese, but she certainly is. She is known for “Snow Flower and the Secret Fan,” “Peony in Love,” and “Shanghai Girls,” but I know her for “On Gold Mountain,” the detailed history of her family and the 100-year history of west coast Chinese-American culture. Lisa, who is one-eighth Chinese and very much assimilated with her Chinese-American family, interviewed over 100 family members and friends, researched for historical information, and traveled to China to her ancestral villages. She added photos and included the family tree. Instead of a dry, factual book of names and nonfiction, she created a story—lived the story, and with dialog!—that captured mostly her Chinese side, but also the sparse Caucasian side of her heritage. Her white great-grandmother grew up unhappily with an older brother’s family after her mother died, but left as soon as she could and became estranged from her family. 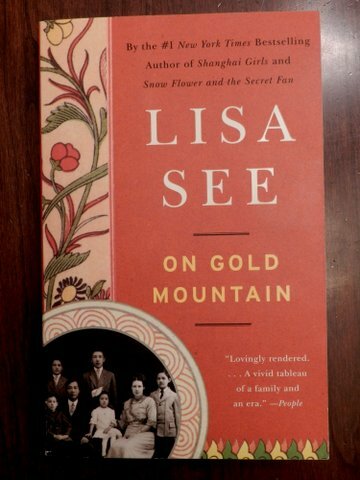 I found it curious how Lisa used real stories of her ancestors and real history to create imagined scenes so that the book reads like a historical novel, yet is still considered a biography/memoir. She weaves in the finer points of working on the transcontinental railroad, of the imported antiques business and the restaurant business, of carpentry and of the immigration system. She seamlessly mixes past tense omniscent (all-knowing) narrator storytelling with present tense dialog—very impressive to do this well and keep tenses straight. Despite all the facts, the book focuses on story and relationships. Lisa brings her family members and even their friends and acquaintances to life with thoughts and feelings, definite personalities. She’s got a wealth of relationships to look at, too—the drama between family members, between cultures, between old world and new. Her family history, like everyone’s, is against a backdrop of sociological changes and how everyone adapts. Most of us won’t be creating a dramatic novel-like history of our families, but reading “On Gold Mountain” can inspire us to dig for our roots, ask for the stories, learn about the history our ancestors lived through, and imagine how it was for them. Lisa was lucky that when she thought about writing the family history many of her numerous elder relatives were still alive and forthcoming in their stories. And they remembered stories passed down to them. Those of us who do not have the old stories can still find records and information and meld the sociology and history of what our ancestors lived through to re-create some of what their lives were like. We can still make our family histories breathe a little and be fun to read. If you do read “On Gold Mountain,” be sure not to skip the beautiful epilogue. This entry was posted in book talk, history, lifewriting, multicultural and tagged culture and heritage, family history. Bookmark the permalink. I have read this novel and I think it was fantastic just all her other books. Hi Marjorie, thanks for stopping in and commenting. This book is actually categorized under biography/memoir! Obviously there is a lot of leeway in imagining what others in the family have said (think Mary Karr, too), but Lisa got a lot of her stories and approximate dialog from living family passing the stories on. I love how even in her fiction Lisa researches and tells the stories of women and children, the ones left out of the history books. I must say I was absolutely shocked with the stories of Snow Flower and the Secret Fan and Dreams of Joy, these 2 are my very favourite books ever. Reblogged this on yoUR HISTORY, LLC.